History was made when NASA (National Aeronautics and Space Administration) launched KalamSAT, the world’s smallest satellite, on June 22nd, 2017. KalamSAT, whose name is taken from the former Indian president and nuclear scientist, Dr. A. P. J. Abdul Kalam, weighs just 64 g. The satellite was designed by Rifath Sharook, an 18-year-old Indian student from the town of Pallapatti, in the Indian state of Tamil Nadu, and the six other teammates in his group. But with satellites getting smaller and smaller, it leaves us asking “How many satellites are in orbit?” Also, how many will be in orbit after thousands of nanosatellites are launched? NASA flew the satellite onboard the Terrier-Improved Orion Rocket, launched from their flight facility site on Wallops Island, Virginia, USA, at 3 pm (IST) on June 22nd. The rocket had a total flight time of 240 minutes. After separating from the rocket, the satellite spent 125 minutes in space after liftoff, within the micro-gravity environment, and subsequently fell into the sea. The data collected will be investigated by the Indian group. The group behind KalamSAT consists of seven team members. Rifath Sharook as the lead scientist, Tanishq Dwivedi as the flight engineer, Vinay S Bhardwaj as the design engineer, Yagna Sai as the lead technician, Mohammed Abdul Kashif as the lead engineer, Gobinath as the biologist and Dr. Srimathy Kesan as the supervisor. KalamSAT was put together in Chennai, T Nagar, the home of Dr. Kesan. Dr. Kesan is also the founder and CEO of Space Kidz India, an institution created to attract students in India to the subjects of Arts, Science and Culture. This is not the first time that Sharook, the lead scientist of the project, has appeared in the news. When he was 15 years old he invented a helium weather balloon that weighed 1.13 kg for a project within Space Kidz India. Specifications of KalamSAT include its 64 g weight and 3.8 cm3 size, allowing it to fit into the palm of one’s hand. It was built using the 3D printing method with reinforced carbon fiber polymer, an extremely resilient yet light fiber enforced plastic that contains plastic fibers. A nano Geiger Muller counter was mounted on the satellite, an instrument used to measure radiation during the mission in space. Also included were several other sensors to measure rotation, temperature, humidity, pressure, acceleration and the magnetosphere of the earth. KalamSAT is a femto satellite. These are small satellites with a weight of less and 0.1 kg, including fuel and payload. Technically, it was deployed as a technology demonstrator satellite as it did not reach orbit but flew a sub-orbital trajectory. This is because although the satellite reached space, it fell back to Earth before completing the full orbit. KalamSAT appeared in the Asia Book of Records, the Assist World Records and the India Book of Records as the “World’s lightest and smallest satellite”. Not only is KalamSAT the world’s smallest satellite, it is also the first time that 3D printing has been used in space. The main role of the satellite was to show the ability of the 3D printed carbon fiber to perform in such missions. In addition, this is the first time an experiment from an Indian student has been carried out by NASA. A Sprite ChipSat with labels indicating subsystem components. Credit: “Sprite ChipSat” by Zac Manchester via Wikimedia Commons is licensed under the Creative Commons Attribution-Share Alike 3.0 Unported license. KalamSAT was chosen for the mission after winning the STEM (Science, Technology, Engineering, Arts, and Mathematics) based competition Cubes in Space, organized by NASA and I Doodle Learning, an organization focusing on global educating. The objective of the competition was to design an instrument that was able to fit into a cube the size of 4 m, to be flown into space. Cubes in Space is run to give students aged between 11-18 the chance to design an experiment to be launched by NASA into space with either a rocket or balloon. Since its initiation in 2014, the program has had 5000+ participants from close to 40 countries. Before Sharook and his team participated in the competition, they designed a CubeSat weighing 1 kg. A CubeSat is a small satellite made up of 10 x 10 x 10 cm cubes, with each cube not weighing more than 1.33 kg. However, its construction proved too expensive for their budget and they decided to build a smaller version for the competition. After the group designed and built KalamSat, they began to investigate how to launch the satellite and discovered the method of BalloonSats, a way to carry light payloads into near space. Using this, they developed a Near Space Launch Vehicle (NSLV) for the launch of their satellite. This NSLV was further developed into Kalam 2 and has won a place in NASA’s Edge of Space Balloon Flight challenge. The balloon satellite consists of a payload of a nano robot, blood samples, plants, a measurement sensor and a space printer. Dr. Kesan was said to describe the aim of this second mission as to encourage space tourism in India. The blood samples will be used to investigate how blood reacts in space. The balloon is planned to be launched later this year, in Columbia, New Mexico. 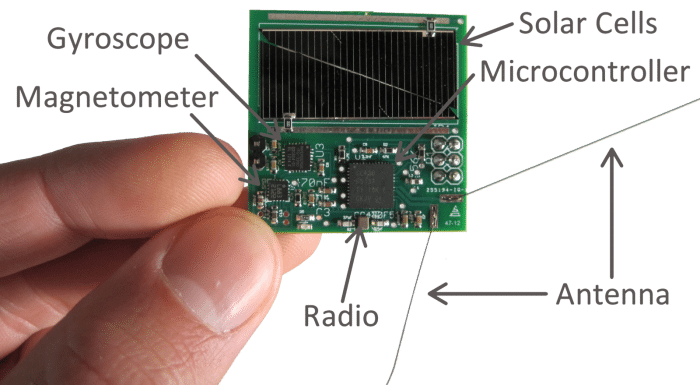 KalamSAT is an example of the next generation of miniature satellites that are being developed worldwide. Sputnik-1, the first artificial Earth satellite, had a diameter of just 58 cm. Since then, satellites have exploded in size, for example, GOES (Geostationary Operational Environmental Satellite)-16 weighs 2,800 kg and GOES-15 weighs 1,540 kg. Such large satellites not only orbit the Earth but also other planets in the solar system. However, over the past few decades, “small” satellites have been developed, aiming to reduce costs associated with their construction and launch. These satellites can be categorized according to their mass. Femto satellites are those that weigh less than 0.1 kg. As detailed above, KalamSAT falls into this category. The concept of Femto satellites goes back to the 1990s, when scientists had the idea of minuscule sensors that measure temperature, radiation, movements, location, and have the ability to detect biological and chemical substances. In 2011, the first femto sat project was initiated, known as KickSAT, developed by scientists from the University of Cornell. The Lead Engineer of the project at the time, Mason Peck, described the minuscule satellites as being able to “travel through space like dust” and “sailing” to locations without using fuel, as they are transported by solar winds. The mission launch was carried out on April 18, 2014. 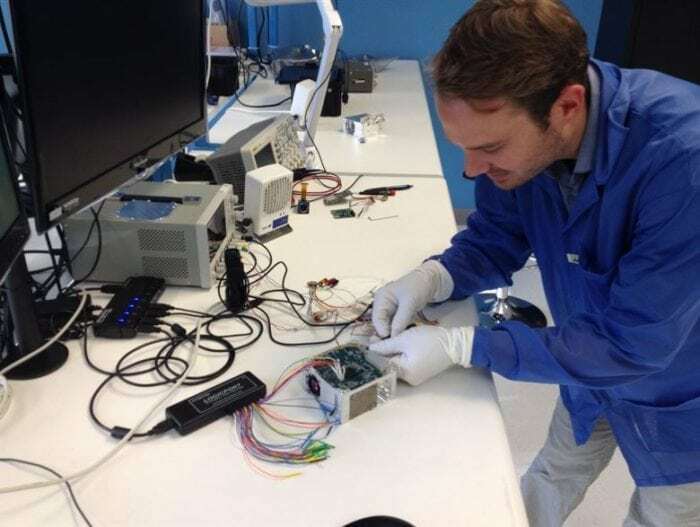 KickSat was started with the idea of making space exploration more accessible due to lower costs, with the ability to simultaneously launch multiple spacecraft due to their small size and mass. The KickSat Sprite is a 3.5 x 3.5 cm single board spacecraft that contains a radio, microcontroller, and solar cells. These satellites have the ability to hold sensors such as gyroscopes and thermometers. However, the KickSat Sprites were never deployed from KickSat due to a clock reset and ultimately burned up inside. KickSat 1 was able to orbit the Earth as a CubeSat, weighing 5.5 kg. These types of satellites are used mainly to collect information about radiation, chemistry, and particles. Such small satellites will not be able to copy the data collection abilities of large satellites; however, they can be used in mass for different objectives. The size of such satellites makes them much cheaper to build and launch. This has allowed access to these projects to universities, who are usually on a small budget. The Space and Terrestrial Robotic Exploration (SpaceTREx) group, at the Arizona State University, have created their own femto satellite, known as the SunCube, with a size of 3 cm3 and a weight of 35 g. They have estimated that it would cost about $3000 to launch the satellite into a low-earth orbit. Reaching outer space would be more costly, around $27, 000, however, this is still a lot cheaper than the standard cost of launching a satellite into outer space, at around $70,000 per kg. The group explains that the evolution of small satellite technology is making it more accessible to personally enter into space science. Such satellites do not have the ability to reach the planets in the solar system, however with a cost of several hundred dollars they are effective in observing the Earth, other larger satellites and for data collection for students. They are able to carry small sensors, cameras, radios and a solar panel for power supply. Larger than femto satellites are picosatellites, with a weight between 0.1 and 10 kg. Picosatellites usually work in groups, or “swarms”. Some are designed to work with a “mother” satellite in order to communicate with ground controllers. CubeSats are examples of picosatellites (and nanosatellites, described below). They are mainly low orbit satellites, within the region 300-1300 km above the Earth. However, they have the potential to be launched further into space. For the future, NASA aims to launch CubeSats not only to the moon but also to Mars. The CubeSat was first created in the 2000s by graduate students from the California Polytechnic State University and Stanford University, in a project aimed at encouraging space science and exploration. These CubeSats were launched in June 2003 with a rocket launch vehicle. This has been followed by, for example, NASA, the National Reconnaissance Office and Boeing creating and using their own CubeSats. There are currently approximately 130 CubeSats operational and in orbit. Other CubeSats include SwissCube-1, which is used to monitor the night glow from the Earth’s atmosphere. Nanosatellites are satellites that weigh less than 10 kg. The Bright Target Explorer (BRITE) mission uses several nanosatellites, designed by the Space Flight Laboratory at the University of Toronto Institute for Aerospace Studies. The telescopes weigh 7 kg and are approximately 20 cm on each side. The telescopes launched on this mission focus on monitoring bright stars for different wavelengths of light. Part of the low-cost satellite group that includes the CubeSats and femto satellites described above, nanosatellites can take between a few months to several years to develop and test. This is a contrast to the Hubble Space Telescope, which took 12 years to build. STRaND-1 is a series of 3 CubeSats joined together, creating a nanosatellite. It is the first satellite launched into space that is powered by a smartphone, developed at the Surrey Space Centre at the University of Surrey, launched in 2013. A Google Nexus One smartphone, with an Android operating system, is used to operate the system. The smartphone encompasses almost all the technology necessary for the satellite, such as the camera, radio links, and high-performance CPUs. Additional features not found on the smartphone are the solar panels and propeller. The satellite is used, for example, to monitor the Earth’s magnetic field and to log photographs. Nanosatellites are followed by microsatellites (between 10-100 kg), and mini-satellites (100-500 kg). The rapid development of satellite technology and reductions in cost offer young students like Sharook the opportunity to explore space science in ways that would otherwise not be available. Such prospects in educating students is highly important for the future of space scientists and engineers and space discovery. There are many competitions and projects aiming to encourage students to take part in space science, just like Cubes in Space. For example, Educational Launch of Nanosatellites (ElaNa) is an initiative by NASA created to attract students from a science, engineering, technology, and mathematics background. NASA also runs the CubeSat Launch Initiative. This provides opportunities for universities, schools, and NGOs to create small satellite payloads that can be flown in future launches. However, there are also some concerns associated with this advancement in satellites. For example, with the satellites becoming more accessible to the public, there is an increase in space debris, or space “junk” that is orbiting the Earth. This opens up the risk of collision with other equipment that is also in orbit. At this point in time, the amount of small satellites in orbit is not a concern, however, this could change in the future, with the expected increase in amateur satellites. Such risks may lead to tight regulations, for example relating to Earth-space communications. Like with all rapid technological advances, a balance should be found between the benefits and concerns relating to the consequences of such advances, and the focus on giving opportunities to young people should remain. Trevor Nace is the founder of Science Trends. He holds a PhD in geology from Duke University and writes regularly for Forbes on geology, earth science, and natural disasters.